I recently had the chance to catch up with Dan Clermont of Set it Off and chat about their up coming record, Duality that will be released October 14 on Equal Vision Records, their upcoming tour the Black Mass Tour with Black Veil Brides, Falling in Reverse, and Drama Club, and what to expect from Set it Off next! The group has been extremely busy lately and have a lot happening for them in the next few months. Check out what Dan had to say about it all! You guys are slated to release Duality October 14 on Equal Vision Records, what are you most excited for about this release? I’m mostly excited for people just to finally hear and see our vision in its final form. We’ve released a couple of tracks over the past month to help people get an idea of what Duality is but there shouldn’t be any question come the date of the release. What was different about recording this time around? There were two major differences with the recording process this time around. The first being that it’s the first time we’ve ever worked with multiple producers, which for a lot of people could be scary but for us working with other people opened the chance for their ears to really grasp our sound and hear things that others may not. The second being our approach to arranging and writing these songs was more focused on creating the ideal melody instead of harping on the instrumentation so heavily. If it wasn’t something we could sing a cappella then it wasn’t strong enough in our eyes. 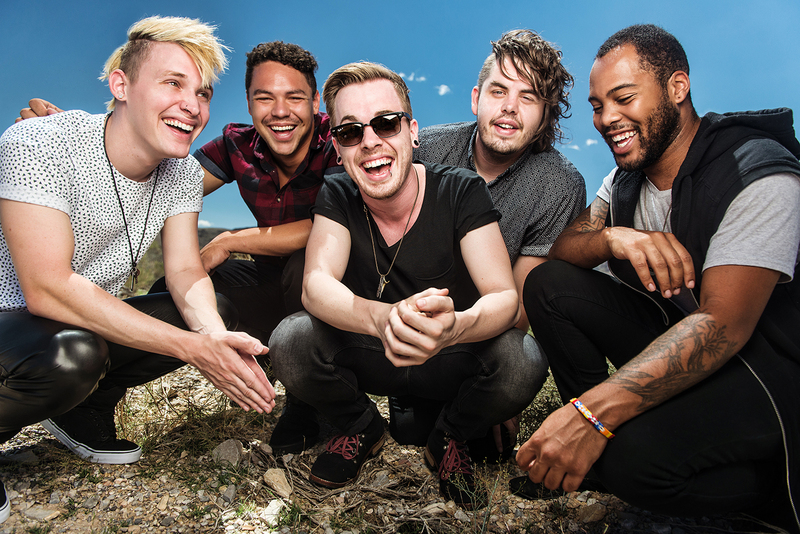 Duality takes on an entirely new sound for Set It Off, how would you describe the new sound? Duality is what we like to call Dark Pop. A good portion of pop songs that you hear out there are generally in a major key and we wanted to really showcase the darker side of things, while still having the ability to make something with a strong groove and those elements of pop we all love. What inspired this change in sound? Not sure if the change was more of it being organic, as opposed to an inspiration. We’ve all had a strong love for pop music and have always felt that our music should always progress sonically from album to album and it was something that we had all grown up listening to and had a comfortable sense a familiarity to. As we started demoing for this album, the songs just by themselves, started to sound more and more what is now Duality and everything just felt right so we made the jump. What has been the reaction to your current single, “Why Worry”? It’s been overwhelmingly positive. I don’t want to say it’s the complete opposite but its a pretty far stretch from the last single we released over a year before called ‘Partners In Crime’. We wanted to come out really strong and not beat around the bush of the band we want to be and what to expect from us, as we begin pushing this album cycle and ‘Why Worry’ did what we has hoped it would. Which song off the record is your favorite and why? I’d have to say ‘Forever Stuck In Our Youth’ is my favorite song off of the record. This song to me is the “feel good” track, it’s just a very happy, celebratory theme with a really strong bass/guitar driven riff through out the song that just puts you in that mood to want to get up and dance. This month you’ve been running mini episodes called “sound bites”, how has fan reaction been to them? They’ve been pretty solid. We’ve always been super close with our fan base and I think the more they can get in our heads about the album and things along that they can connect with us that much more. Congrats on the upcoming tour! How do you think your new sound will fit into a tour like that? Thank you so much! I think our new sound will fit just fine on that tour. Both Falling In Reverse and Black Veil Brides have displayed a wide array of diversity in their music and i feel with the kind of live band we are it will make sense with the package. Check out tour dates on Set it Off’s Facebook page! What should fans expect to hear on this tour? A little bit of old and a lot of new! Who are you most excited to be sharing the stage with on the Black Mass tour? I’m just genuinely excited for the experience as a whole. It will be our first time playing on a platform of that size and we were on Warped Tour in 2013 with BVB and have seen FIR multiple times – both bands go hard so I know every night is just going to be so exciting. Your last tour was a co-headliner with Our Last Night, how will tour prep for this upcoming tour be different? With this tour we are playing a lot more new songs so figuring out how to translate that from the album is always a fun process. We’ll also have a lot more on stage production wise than we’ve had before so thats an exciting step for us to finally incorporate that. What goals did you start with when the band formed and how have they changed since then? When we first started my goals were just to be able to tour and play music on a level where I could survive and support myself. At this point I don’t think much has changed on that front but my ultimate end game is to get involved on the producing/song writing side of things when this is all over. What is in the future for Set it Off? Once we finish the BVB tour we will take a little bit of time off and we just started diving into planning 2015 and have lots of exciting things on the table, so you will be seeing a lot of us and all over the world! Anything to say to the SIO Family? Dreamcatchers, we love you guys so much! Cannot thank you enough for supporting us all this time and I hope you’re as excited as we are to take this next step in writing our history together.